Complete Hardware/Software Solution for Live Performance and Recording. 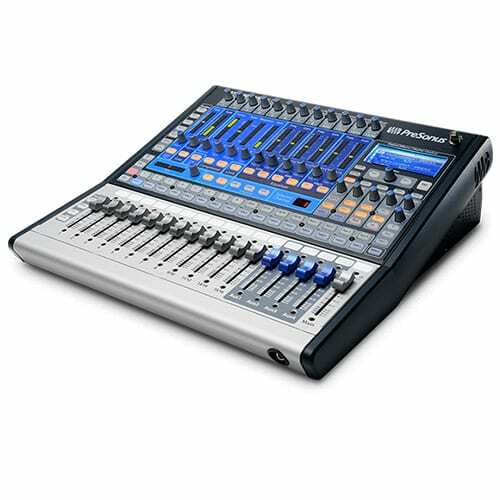 Packed with the same audio quality, performance, and seamlessly integrated software (including remote control) as our industry-leading StudioLIve mixers, but with a smaller, even more affordable package: the StudioLive 16.0.2 is the mixer for small studios on a budget, small churches, schools, bands, and clubs. It’s far more powerful than its size might lead you to believe. Furthermore, it’s amazingly lightweight and offers MIDI control—unique in the StudioLive line. It’s easy to love this portable powerhouse. The StudioLive 16.0.2 features 16 channel inputs, 4 of them stereo channels, and 12 with XMAX mic preamps; a built-in FireWire interface; extensive signal processing on every channel and bus; 4 aux buses; extensive metering; Scene and setting save/recall; MIDI control; and more. Yet it’s lightweight and rack-mountable, operates much like an analog console, and delivers superb audio quality. Plus the bundled VSL control software includes Smaart Measurement Technology! Easy to learn and easy to set up, Studio One 3 Artist is the first choice for anyone who wants to spend more time making music with amazing sound quality. Loaded with new virtual instruments, intuitive mixing features, and many more improvements, Studio One 3 Artist makes it faster and easier than ever before to record and mix your music. Capture is the first digital audio multitrack-recording application designed to make live recording quick and easy. With the look and feel of industry-standard digital multitrack hard-disk recorders, it’s instantly familiar to musicians and engineers. Capture was built from the ground up to work only with StudioLive mixers, so there is no complicated setup or routing. Just click ‘Record Now’ and go. With StudioLive Remote for iPad, (available free from the Apple App Store), a FireWire connection between your StudioLive 16.0.2 and Mac or PC, and a wireless network you can get wireless control over your StudioLive 16.0.2 console and be free to move around the room away from the mixer to tweak your mix. With PreSonus QMix software (available free from the Apple App Store), a FireWire connection between your StudioLive 16.0.2 and Mac or PC, and a wireless network, up to ten musicians can each simultaneously control one of 4 monitor (aux) mixes from the StudioLive 16.0.2 using an iPhone or iPod touch. Automated control and one click recording of all this and more.